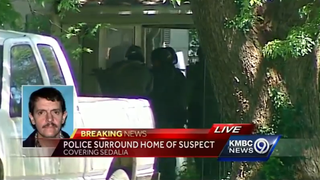 Sedalia police have “identified the suspect” as James B. Horn. After seeing a man they believed to be Horn “walking to some nearby, mostly abandoned, homes in Sedalia,” police began using robots to search the homes for signs of him. As of this afternoon, he has not been found. Lt. Lynch also said that Sutton “had been advised to seek an order of protection against Horn but had not yet done so.” Not surprising for someone who had gone through that amount of physical and emotional trauma. Residents are being advised not to approach Mr. Horn, and to contact police immediately if he’s seen.